The risk of renewed violence and political instability is growing in the Balkans. The decade of progress in postconflict reconciliation and economic recovery after the U.S.-led interventions of the 1990s has stalled and has now, in some areas, even gone into reverse. The international agreements that brought peace to the region, based on the principle that preexisting borders should not be moved to accommodate ethnic differences, are fraying and could unravel with unwelcome consequences for the United States. These could include radicalization of Balkan Muslims, increased Russian troublemaking on the borders of or even inside the North Atlantic Treaty Organization (NATO)—for example, in Albania, Croatia, or Montenegro—and a new refugee crisis for European allies. Over the past decade, the United States has sought to lower its commitments in the Balkans and pass the baton to the European Union, given its proximity and greater leverage to encourage political and economic reform. But Brussels is distracted, disunited, and hesitant. The long recession after the 2008 financial crisis, the Greek fiscal crisis, the flood of Middle Eastern migrants into Europe through the Balkans, and Brexit have soured EU attitudes on enlargement. EU credibility has diminished dramatically, as has its leverage over Balkan politicians who feel threatened by the reforms required for membership but see no prospects of joining the European Union soon. Indicators of rising tensions are already evident throughout the region, notably the growing prominence of nationalist leaders; the increasing use of hate speech in the media; the emergence of armed militias and other extremist groups in Albania, Macedonia, and Serbia; as well as the widespread denunciation and vilification of human rights advocates and anti-nationalists. A repeat of the prolonged and intense military conflicts that blighted the Balkans in the 1990s is unlikely—the conjunction of institutional collapse associated with the breakup of the former Yugoslavia, malign leadership, nationalist political support, and military capabilities that made war possible no longer exists (see map). But violent instability and armed clashes, possibly involving Russian-trained and -equipped paramilitaries, are a real possibility. This scenario could cause extensive ethnic cleansing, crimes against humanity, challenges to existing state institutions, border changes, and further Muslim radicalization. An independence referendum in Republika Srpska. An entity within Bosnia and Herzegovina that has had a Serb majority since the ethnic cleansings of the 1990s, Republika Srpska could vote on independence as its president, Milorad Dodik, has promised. International recognition would be limited, as even Serbia would not want to ruin relations with the United States and European Union. Russia, though, could be tempted to repeat its successful promotion of secessionist regimes as it has in parts of Georgia, Moldova, and Ukraine. A referendum could precipitate a Bosniak Muslim military move to seize the northeastern town of Brcko that links the two “wings” of Republika Srpska and is vital to its survival. Serbia would then have to decide whether and how to intervene (as it did in the 1990s with only a thin veneer of deniability) to sustain Republika Srpska. The referendum could also trigger an attempt at secession by Croat communities along Croatia’s border, embroiling a NATO ally in conflict. Serb or Albanian moves affecting the remaining Serb population in Kosovo. 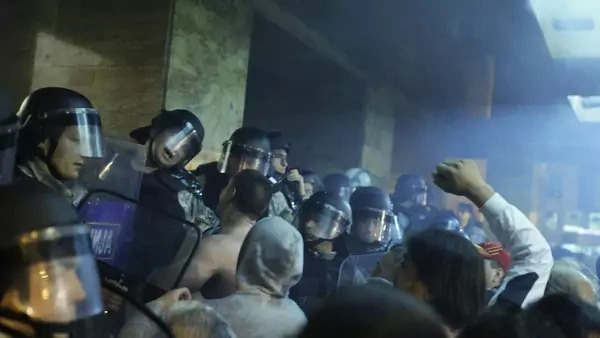 Albanian rioting against Serbs in Kosovo, as occurred in March 2004, could precipitate Serbian military action to protect the Serb-majority municipalities in the north, perhaps even with NATO concurrence. Serb nationalist provocations—such as blocking Albanians from access to Serb-majority areas or ostentatious displays of nationalist symbols—could trigger an Albanian effort to seize the north by force (even now, the area is only loosely controlled by Pristina). The risk of these contingencies will increase if NATO presence diminishes further, as some members think it should. Renewed fighting between Albanians and Macedonians. In Macedonia, Albanian paramilitaries like those that rebelled in 2001 (and appeared suddenly again in April 2015) could seek union with Kosovo or Albania, forcing the Macedonian government to choose between repressing the rebellion or allowing Macedonian paramilitary forces to respond. Skopje, the Macedonian capital, is the center of gravity for Albanians and Macedonians, as it is the largest city for both ethnic groups. Rioting, as occurred in parliament in April, or paramilitary clashes could generate pressure for broader military responses. A terrorist attack or political assassination. An attack by the self-proclaimed Islamic State or al-Qaeda targeting Christians in Bosnia and Herzegovina, Macedonia, Montenegro, or Serbia could trigger revenge attacks against Muslims and even cross-border fighting that could spread to other countries. Assassination of political leaders could precipitate intervention by a neighboring state. Russian destabilization of Montenegro or Macedonia. Moscow has backed ethnic Serbs concentrated in northern Montenegro who were loyal to Serbian strongman Slobodan Milosevic, resisted Montenegro’s independence, and opposed its NATO membership. Moscow is also courting Bosniak Muslim politicians in Montenegro, encouraging their contacts with the Chechen leadership to wean them from their long-standing allegiance to Montenegro. In Macedonia, Russia-backed nationalists associated with former Prime Minister Nikola Gruevski could attempt a comeback using force, provoking an Albanian reaction. An attack by the Islamic State could trigger revenge attacks against Muslims and even cross-border fighting. Ethnic politics in the Balkans are interconnected. If Republika Srpska tries to leave Bosnia and Herzegovina, some Serbs in northern Kosovo will try to leave Kosovo, and some Albanians in southern Serbia will try to leave Serbia. Some Muslims in Serbia could also want to unite with what remains of Bosnia and Herzegovina. If Macedonia is partitioned, its Albanians could want a union with Kosovo and potentially with Albania and Albanian-majority municipalities of southern Serbia, which would trigger the ethnic partitions of Bosnia and Herzegovina, Kosovo, and Serbia. Growing extremist hate speech, recruitment, and actions: parading, exercises, or attacks by armed ethnic paramilitaries in any Balkan country; violent attacks on parliaments; enhanced Islamic State and al-Qaeda recruitment among Balkan Muslims; a mass casualty jihadi attack. Internal political developments: scheduling a Republika Srpska independence referendum; growing pan-Albanian sentiment and agitation in Albania, Kosovo, Macedonia, or southern Serbia; increased political friction within or between Macedonians and Albanians. Increased Russian meddling: expanded cooperation with or financing of Serbia or Republika Srpska; interference in elections in Bosnia and Herzegovina, Macedonia, Montenegro, or Serbia; further expansion of Russia Today and Sputnik News; another assassination or coup plot. Worsening of diplomatic relations: breakdown of EU-sponsored Serbia/Kosovo talks on normalizing relations; worsening of Serbia’s relations with Albania, Bosnia and Herzegovina, Croatia, Macedonia, or Montenegro; breakdown of cooperation among regional defense and interior ministers. The potential unraveling of the U.S.-induced peace settlements in Bosnia and Herzegovina, Kosovo, and Macedonia would reverse significant U.S. diplomatic achievements, risk tens of thousands of lives, add weight to the notion that the West is in retreat, and undermine those who seek peaceful democratic outcomes worldwide. NATO—which still has troops in Kosovo (including about six hundred Americans) and is regarded as a guarantor of Bosnia and Herzegovina’s territorial integrity (even though the troops there now are under EU command)—would be exposed as a paper tiger. Violence anywhere in the Balkans could spread to Albania, Croatia, Montenegro, and even to Bulgaria and Greece, all NATO members, in addition to causing refugee flows into the European Union and eventually the United States, as well as radicalizing some Balkan Muslims. This would distract U.S. allies in Europe from higher priorities the Donald J. Trump administration needs their support to confront, including Iran and North Korea. Violence anywhere in the Balkans would distract U.S. allies in Europe from higher priorities, including North Korea. Regional instability would enable Russia to strengthen its foothold among the region’s Orthodox populations. Its influence would grow in Macedonia, Montenegro, Republika Srpska, and Serbia. Moscow, which already cites Kosovo independence as precedent for its aggressive behavior in Georgia, Moldova, and Ukraine, would treat any future Balkan partitions as post-facto validation of Russian claims in Abkhazia, Crimea, Donbas, South Ossetia, and Transnistria. The United States has three strategic options to prevent a violent unraveling of existing peace agreements: continue its current policy of following the European Union’s lead, work with Russia to draft new borders for the region, or initiate a major diplomatic effort to resolve remaining Balkan problems. This first option would be a variant of existing U.S. policy. Avoiding any more responsibility than it has taken over the past decade, the United States could increase bilateral assistance and encourage the European Union, especially Germany, to beef up existing Balkan commitments. The European Union has launched a Bosnia and Herzegovina reform initiative, a dialogue between Serbia and Kosovo, and an effort to repair Macedonia’s damaged democracy, but implementation often lags. The United States could use diplomatic leverage, including sanctions targeted against recalcitrant politicians, more widely to ensure that progress on EU initiatives continues. The United States could also selectively enhance existing Balkans assistance, which the Trump administration has proposed sharply reducing. Reversing proposed cuts would maintain U.S. credibility and leverage with recipients. Further exploiting close and productive military relationships with Kosovo, Macedonia, and Serbia, which cooperate respectively with the Iowa, Vermont, and Ohio National Guard, would help ensure restraint in regional crises and encourage stabilization if violence breaks out. This option may be inadequate to ensure that the peace agreements do not unravel, which would have dramatic consequences for the region. None of the current EU initiatives, even if fully implemented, would eliminate the underlying drivers of conflict. All aim to relieve pressure rather than overcome the main remaining obstacles to NATO and EU membership. If one or more Balkan states failed, the costs to the United States for the ensuing financial and humanitarian response would be significant. As its second option, the United States could cooperate with Russia to design and implement new territorial arrangements with ethnically determined borders. This would be a major departure from long-standing U.S. policy. Concluding that state-building within existing borders is impossible, Washington and Brussels could embark on negotiations of peaceful ethno-territorial partition, with the resulting states having the right to join their neighbors. Moscow would welcome and cooperate with such an initiative. The result would be partition of Bosnia and Herzegovina, Kosovo, Macedonia, and Serbia. Bosnia and Herzegovina could be partitioned three ways, with the Croat portion joining Croatia and the Serb portion joining Serbia, leaving one or two small, mostly Islamic republics, one near Sarajevo and possibly one in western Bosnia and Herzegovina surrounding Bihac. The majority-Serb Kosovo municipalities (north of the Ibar River) would join Serbia and the majority-Albanian portion of southern Serbia (Presevo and Bujanovac) would join Kosovo, while the majority-Muslim municipalities of Serbia’s Sandjak could join Bosnia and Herzegovina. The majority-Albanian northwestern part of Macedonia would join Kosovo, with the Macedonian-majority remainder either independent or joined to Bulgaria. Skopje would be divided. Kosovo, enlarged by the addition of Presevo and Bujanovac as well as the northwestern part of Macedonia, could then choose to join Albania, precipitating the movement of most Kosovo Serbs (who live south of the Ibar River) to Serbia and abandonment of the Serb monuments and monasteries south of the Ibar. Regional partition would require heavy diplomatic lifting on the part of the United States and deployment of tens of thousands of U.S., European, Russian, and other troops to guard and enforce population movements and reduce the likelihood of violence. Costs to the United States for these deployments could run into the billions of dollars. NATO and EU membership would be postponed indefinitely and reforms would stagnate. Washington would need to accept one or more explicitly Islamic ministates with no prospect of NATO or EU membership as well as potential for generating extremists. It would also need to accept a Greater Serbia allied with Russia and uninterested in NATO or EU membership. Accepting Balkan border changes would greatly strengthen Russian arguments for border changes in Georgia, Moldova, and Ukraine and undermine U.S. opposition to independence for Catalonia and Iraqi Kurdistan. As a third option, the United States could recommit to leading an effort to construct viable democratic states governed in accordance with the rule of law and eligible for NATO and EU membership. None of the available diplomatic tools requires commitment of major new financial resources, but they would need heightened political attention to the region to prevent far more costly commitments in the future, ensure that the European Union continues to carry most of the Balkans burden, and hinder Islamist radicalization. The United States could recommit to leading an effort to construct viable democratic states. Accelerate NATO and EU membership. Washington and Brussels could remove obstacles to faster progress in NATO and EU accession or find other ways of increasing their influence on Balkan behavior. Montenegro’s NATO accession was an important signal to the region that the door is not slammed shut, and NATO could continue to use its Partnership for Peace program and Membership Action Plan to good effect. The United States could give additional resources and visibility to its National Guard cooperation with Balkan states. Washington could encourage the Organization for Security and Cooperation in Europe (OSCE), which maintains an extensive Balkan democracy promotion network, to redouble its efforts, as well as take on reconciliation among ethnic groups. The European Union could be encouraged to create a new category of “associate” membership or something similar that brings Balkan candidate countries further inside its decision-making process without giving them the votes associated with full membership. Develop and use better carrots and sticks. While the European Union has exhausted many economic incentives, the United States has not. It could consider bilateral agreements to provide Balkan countries with market access as a reward for meeting NATO and EU requirements. Washington could also encourage the non-EU Balkans countries to form a free trade area among themselves, which could then negotiate market access with the United States. The U.S. Department of the Treasury has sanctioned some Balkan individuals, blocking their access to the U.S. financial system and preventing them from traveling to the United States because of the obstacles they pose to peace, security, and democracy. While the sanctions may have few practical consequences, the symbolism has seriously affected the political calculations of some of those individuals. A similar sanctions scheme throughout Europe, whether implemented by the European Union or individual nations, could strengthen Brussels in dealing with recalcitrant political leaders and their cronies. Blocking them from accessing the European banking system would be particularly useful. Focus on rule of law. Corruption, trafficking in drugs and people, and other illicit activities are major sources of grievance throughout the Balkans. They undermine government legitimacy and make it difficult to qualify for NATO and EU membership, which further feeds discontent. Extremists both profit from illicit activities and exploit them to criticize governing authorities and recruit cadres. European and American assistance programs could be reoriented to focus primarily on rule of law. Enhance U.S. diplomatic efforts to resolve specific problems. In several Balkan countries, distinct issues could be resolved through enhanced U.S. diplomatic efforts. This could require appointment of a special envoy responsible for mediating and resolving hot spots in close cooperation with the European Union, in particular in Bosnia and Herzegovina, Kosovo, and Macedonia. In Macedonia, the unresolved issue with Greece concerning Macedonia’s name (which has, in turn, stalled the country’s NATO membership bid) persists. Ethnic tensions have increased between Albanians keen on NATO membership and Macedonians more concerned with preserving the country’s name. U.S. pressure on Athens and Skopje to allow Macedonia into NATO as “The Former Yugoslav Republic of Macedonia” (as required by the 1995 interim agreement validated by the International Court of Justice in 2011) would require presidential leadership. In Bosnia and Herzegovina, the United States could relaunch the constitutional reform initiative, which came close to success in 2006, or an electoral reform effort. It could also encourage the European Union to be much stricter in requiring implementation of agreed reforms. The United States could press the Europeans to move their troops—now scattered in militarily insignificant numbers throughout Bosnia and Herzegovina—to Brcko, signaling to both Serbs and Bosniaks that this center of gravity will not be allowed to fall to either should violence recur. If Republika Srpska schedules an independence referendum, the United States and European Union could prepare and publicize their vigorous response to forestall the vote. This response could include using the high representative’s “Bonn powers”—that is, the power to enact binding decisions—to declare the referendum legally null and void. It could also include diplomatic nonrecognition and ineligibility of an independent Republika Srpska (or any country it joins) for EU membership or loans from the International Monetary Fund (IMF) or the World Bank. Kosovo’s progress toward meeting the military requirements for NATO membership has stalled due to Serbia’s opposition, stemming partly from concerns about how Kosovo’s army might be used. The United States could help resolve this quandary by urging Belgrade to accept Kosovo UN membership and exchange ambassadors with Pristina, in return for a Kosovo army designed not for territorial defense but rather for deployment on international missions. Serbia has preferred to wait until just before its EU accession to accept Kosovo’s sovereignty, but that is a mistake because Serbia’s leverage would then be weak. NATO could draw down its forces once relations between Belgrade and Pristina are normalized. In addition to resolving country-specific issues, which provide openings for Russian meddling, enhanced U.S. diplomacy could focus on ensuring that the Balkans, much of which depends on Russian natural gas imports, has alternative sources: U.S. liquefied natural gas, Azerbaijani gas, or eventually eastern Mediterranean gas from Cyprus or Israel. The United States and European Union could consider sanctions on Russian individuals or companies that provide financing to sanctioned Balkan leaders. The United States could also use its influence with NATO members to block Russian air and ground access to the Balkans, especially to its “humanitarian” base in Serbia if that is used for nefarious purposes. A portion of the democratization resources that the U.S. Congress is making available could be used to beef up U.S. broadcasting through the Voice of America and social media efforts in the Balkans to offer a more positive image of the United States, European Union, and NATO. Consultations with Washington and Brussels on countering Moscow’s meddling in Balkan elections could be useful too. U.S. diplomacy could ensure that the Balkans, much of which depends on Russian natural gas, has alternative sources. This option requires high-level political commitment to risky state-building enterprises of a sort the Trump administration wants to avoid. They could fail, as efforts to fix Bosnia and Herzegovina’s constitution and to get Macedonia into NATO have in the past, causing high-level political chagrin. Moreover, this option would not resolve all Balkan conflicts. It could, however, address the most salient issues that block progress. It is also the most cost-effective preventive option, as the expenditures that the first two options require surpass those of the efforts detailed here. Sponsor with Russia and EU members a UN Security Council resolution condemning any outbreak of large-scale violence in the Balkans, naming and sanctioning parties that have contributed to it, cutting off assistance to any aggressor, and imposing an immediate cessation of hostilities. For a Bosnia and Herzegovina contingency, convene with EU members and Russia an emergency meeting of the Peace Implementation Council—the body that oversees the Dayton agreement—to authorize action by the high representative, who still has powers to block or dictate legislation and fire officials. In the event of a Republika Srpska declaration of independence or any such unilateral effort at partition, refuse recognition, withhold assistance, and make it clear that IMF and World Bank aid will also be blocked, in cooperation with the European Union. Redeploy some or all U.S. troops in Kosovo and NATO troops from neighboring countries to northern Kosovo, Brcko, Skopje, or any other location of instability to assist in reestablishing a safe and secure environment as well as warning off any perpetrators. Block Russian use of the base in Nis, Serbia, to resupply or otherwise aid Balkan belligerents by getting friendly countries to deny overflight permission. Seek OSCE monitoring of any cease-fire and mediation of disputes. Reject any territorial changes and pursue negotiation of an unconditional return to the status quo. Reiterate with the European Union, and if feasible with Russia, the United States’ irreversible commitment to existing Balkan borders and states. Nothing can be gained from continued speculation about border changes in the Balkans, which would unravel the peace established in the 1990s and incur massive diplomatic, political, economic, and human costs. The United States should encourage the European Union to state explicitly to Serbia that complete normalization of relations with Kosovo, including UN membership and exchange of ambassadorial-level diplomats, as well as respect for the territorial integrity and sovereignty of Bosnia and Herzegovina, are conditions for Serbia’s EU accession. Develop in cooperation with European partners new incentives for Balkan countries, including enhanced access to U.S. markets and accelerated EU membership. Accelerated candidacy for EU membership worked in getting Serbia to negotiate with Kosovo as well as Bosnia and Herzegovina to initiate economic reforms. Accelerating membership negotiations would have a similar mobilizing effect, as would opening U.S. markets. Jointly sanction Balkan leaders who threaten democracy, peace, and security by blocking individuals from traveling in the European Union and United States or utilizing their financial systems. Past legal challenges have made Europe hesitant, so new procedures are needed. Republika Srpska President Dodik, already sanctioned by the United States, should be the first target, but other Balkan leaders who stoke ethnic tension should also be targeted. Joint U.S.-EU action would amplify the political impact. Publicly enunciate a planned joint response to Republika Srpska’s independence referendum, if it is called. This step should include both invalidation of the referendum by the high representative and a U.S./EU statement that no bilateral, IMF, or World Bank assistance or recognition will be provided to an independent Republika Srpska or to any country of which it becomes a part. Establish a region-wide truth and reconciliation effort that would seek a common understanding of what happened during the conflicts of the 1990s as well as compensation for victims. This should include citizen-to-citizen exchanges like those that laid the basis for French-German reconciliation after World War II as well as joint work on history textbooks throughout the region to ensure they are not teaching hatred that will generate future violence. Reorient assistance to the rule of law, with a focus on fighting corruption, trafficking, and extremism. U.S. and EU assistance should focus more on building independent judiciaries as well as law enforcement authorities that both observe international human rights standards and vigorously pursue wrongdoing, including the capture of state institutions by corrupt politicians and the radicalization of Balkan youth. Enhance democratization resources and activities. The OSCE spends $47.2 million per year in Southeastern Europe (former Yugoslavia plus Albania), the lion’s share in Kosovo. This and U.S. democratization aid should be doubled to provide resources for region-wide democracy promotion and reconciliation. Consider redeployment of U.S. and EU troops to maximize their deterrent effect. European troops are sprinkled throughout Bosnia and Herzegovina in militarily insignificant “presences.” They should be redeployed to Brcko and other potential hot spots. Some U.S. troops in Kosovo should be moved to the north, the most problematic area. Appoint a U.S. special envoy for the Balkans. This person would seek to resolve specific issues in close consultation with the Europeans, as well as ensure high-level U.S. government visits to cooperative Balkan countries, several of which have been neglected in recent years. This exception to the Trump administration’s limits on special envoys would be justified on the basis that risks in the Balkans require more attention than the State Department’s current part-time effort. The special envoy should seek to ensure high-level U.S. government visits to Balkan countries, several of which have been neglected in recent years. In Bosnia and Herzegovina, the special envoy should focus on reforms to enable functional and effective governance at all levels, including a central government able to negotiate and implement the requirements of NATO and EU membership. In Kosovo, he or she should help foster the creation of an army that poses no threat inside the country and is capable of substantial contributions to international missions, including by the United Nations and NATO. Efforts in Serbia should put an end to the Russian veto on Kosovo UN membership and Serbian opposition to Kosovo’s army. In Macedonia, efforts should promote transparent and accountable governance and NATO membership at the next summit. Strengthen U.S. efforts to counter Russian hybrid warfare. Prospects for cooperation in the Balkans with Russia will only improve once Washington pushes back against Moscow’s troublemaking. The United States should make a major commitment, on the order of $20 million, to Balkan broadcast and social media, making it harder for Moscow to spread its propaganda. Brussels should match this commitment. The United States should also be prepared to use its diplomatic influence to deny overflight permission into the Balkans by Russian aircraft if they fly missions incompatible with NATO interests. Resources for National Guard cooperation with Balkan countries, as well as its visibility, should be increased. Washington and Brussels should consult with Balkan governments on how to block Russian election interference as well as promote creation of economically viable natural gas networks to minimize dependence on Russia. Washington should let Moscow know that once relations between Belgrade and Pristina are fully normalized, the remaining NATO troops in Kosovo will be withdrawn, but all Balkan countries will still have the option of joining NATO if they meet the membership criteria. These recommendations, if implemented, would serve to preserve peace and stability, protect U.S. interests, and limit Russian troublemaking in the Balkans. They would also complete peace processes that have the potential to make the region secure, prosperous, and friendly to the United States and Europe.